To photograph Carly Weasel Child, Avenue went on location to Siksika Nation. 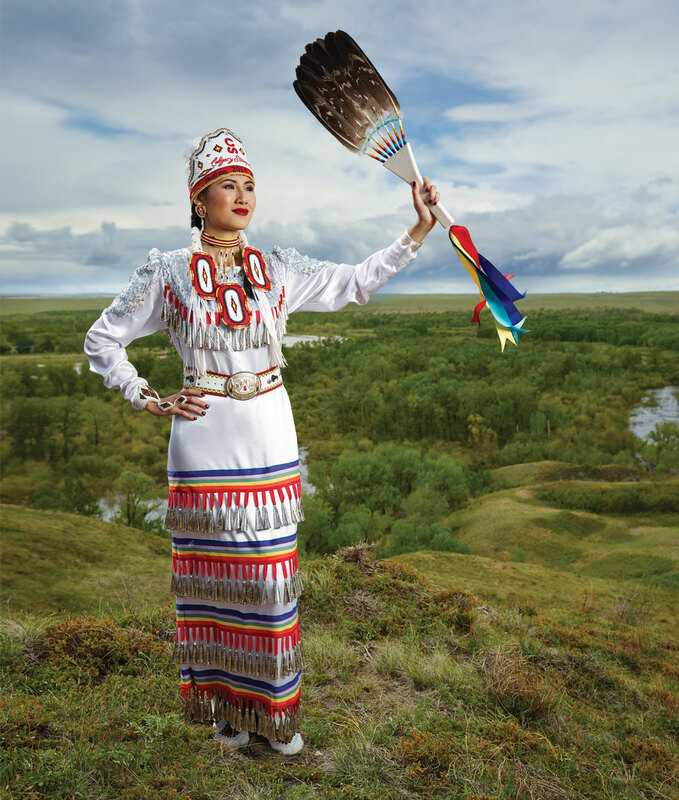 Watch this video by Ryan HK to see the land that Weasel Child grew up surrounded by, the beautiful movement of her jingle dress and how photographer Noah Fallis, stylist Kara Chomistek and hair and makeup artist Joanne Black pulled it all together for our July issue. Seated in a boardroom at Calgary Stampede headquarters and wearing an intricately beaded crown, Carly Weasel Child says it was always a dream of hers to become the Calgary Stampede Indian Princess, an ambassadorial role for the five tribes of Treaty 7, the Indian Village and the Calgary Stampede. The Siksika Nation resident joins four other family members who have previously held the title. The past year of her life has been a whirlwind of local, national and international appearances, which she has squeezed into her already busy schedule as a student who plans to eventually pursue a bachelor degree in mass communications, following her current studies at Old Sun Community College. Several new garments, from a casual Pendleton jacket to the exquisite and refined red ribbon dress, have been custom-made for Weasel Child’s many public appearances, and, of course, her participation in the annual Calgary Stampede Parade. Each article is a work of art, and each is meaningful to the young woman who wears it. Weasel Child’s jingle dress was made by Heather Crowshoe. On the downbeat of the jingle dance she raises the eagle tail feather fan in the air and then brings it down, giving thanks to the Creator. Her belt was made by the 2011 Indian Princess, Whitney Wilkie. On it is written her Blackfoot name, Papainhkkiakii. Her belt buckle is custom made by Montana Silver and was designed by 1995 Indian Princess Ivy Kim Scott Friesen. Choker, crown, braid ties and earrings, all by Stacey Running Rabbit; ring bracelet, leggings and moccasins, all by Laura Asham. Congratulations on becoming the 2014 Calgary Stampede Indian Princess. What was the competition process like? The competition is a full weekend of events, and you are judged on your horsemanship skills, powwow dancing and public speaking. How are your horsemanship skills? I know the basics; I know not to fall off! Weasel Child wears a traditional ribbon dress made for her by Heather Crowshoe. The lighter bands around the lower half of the dress are inspired by warrior spirits and represent their enlightened messages of encouragement. Her official Calgary Stampede crown was hand-beaded by Stacey Running Rabbit. 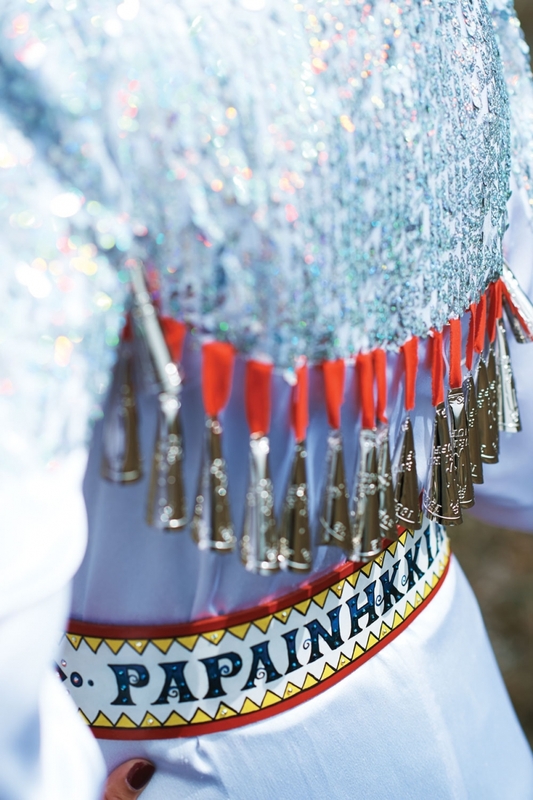 It features five rhinestones that signify the five tribes of Treaty 7. Earrings by Stacey Running Rabbit; boots by Alberta Boot Company; belt by Whitney Wilkie; custom buckle by Calgary Stampede. Which element of the competition did you most enjoy? I’ve been dancing since I was three years old, so that part was easy. My mom really wanted me to be a jingle dress dancer. Growing up, I could have chosen to be a fancy or traditional dancer, too. Describe an average day since becoming the Indian Princess. An average day starts by checking my schedule. I live in Siksika, so I have to leave about two hours ahead of time to get to the city and be ready in either my regalia or my Western wear, depending on the event. If I don’t have an event scheduled, then I’m either in class or spending time with my family and my dog, Stella. We call her our unofficial mascot. Why was it important for you to become the Indian Princess? Growing up, it was always something that I wanted to do. I like to be involved with the community and it’s wonderful to represent my culture. Definitely dancing at the events and meeting so many new people and talking about the Stampede, the Indian Village, Siksika and my culture. First Nations have been involved with the Stampede since it began back in 1912, so it’s important to show that unity. Several other of your family members have held the title of Calgary Stampede Indian Princess. Tell us about them. Actually, four others have won the title before me. My aunty Donna Weasel Child was the second Indian Princess in 1966. My aunty Gaylene Weasel Child was crowned in 1997 (she’s actually my cousin, but she is a little older than me, so I always call her aunty). My older sister, Charity, was the 1998 princess and, most recently, my cousin Natasha Calf Robe-Ayoungman in 2003. How does it feel to follow in their footsteps? I’m so proud and it’s great to compare our experiences. They are always giving me advice like to smile, take lots of pictures and be open – little tips like that. Who would you say was central to passing on the traditions of your culture? My entire family, and especially my Grandma Alice, who’s about 91 now. When I visit her, she tells me stories about when she was younger and how she lived in teepees. How does your culture help to define your identity? My parents raised me to believe in the traditions and history of my culture. I love to represent my culture by dancing at powwows. I also love finding turquoise and beaded jewellery and clothing that includes cultural designs. How do you feel when aboriginal culture is used in fashion trends? It all depends on whether the designer pays respect to the culture. If they get permission and use a design on a shirt, for example, it’s wonderful to see people expressing that and being so accepting of First Nations, but a model wearing a headdress, to me, is crossing the line because a headdress is sacred and people have to earn those. How do you preserve the traditions of your culture? There are not many books about our culture, not much about it on the Internet, and our language is slowly dying out. Traditionally, our history ispassed on through oral tradition, so I am taking a course on my Blackfoot language. I try to incorporate my language into everyday life. Weasel Child’s Calgary Stampede parade regalia was made by Janine’s Custom Creations. It was inspired by her family’s teepee, which stands at the Indian Village. Her boots were handmade by the Alberta Boot Company and feature the same motif. Her ring is a family heirloom; earrings by Stacey Running Rabbit; belt by Whitney Wilkie; custom buckle by Calgary Stampede. What is the heritage behind your name? My Blackfoot name is Papainhkkiakii, which means “dream-singing woman.” Your Indian name is given to you by a medicine man. You either tell him something about yourself and he will give you a name, or he has a dream. I was named after the medicine man heard a song in a dream. You recently returned from your second trip to Germany as part of your duties as Indian Princess. How was it? Oh my gosh, it was amazing. I still can’t believe that I went once, let alone twice. The first time around, it was eye-opening because I’d never been overseas before; I got my first passport a week before the trip. What was in your suitcase? A lot! We managed to squeeze everything into one suitcase – two jingle dresses, two ribbon dresses and all the beadwork, along with my regular clothes. How did you feel your First Nations culture was perceived in Europe? People were curious, and I believe that it was, for some, the first time they had met a Native Canadian person. They were fascinated with the designs on both my dresses and the beadwork and asked lots of questions and took lots of pictures. Winning the title includes being awarded a custom regalia wardrobe. Tell us about your new jingle dress. mythology] roped in the clouds, stopped the rain and made a rainbow. She incorporated that into the dress and named it “Napi’s rope dress.” I can’t thank Heather enough for the dress; she thought about every detail. Tasha Polizzi jacket from the Calgary Stampede store; skirt by Janine’s Custom Creations; belt from Lammle’s Western Wear & Tack; earrings by Montana Silver; bolo tie by Bow River Studio. How many jingles are on your dress? Traditionally, a dress will have 365 cones made from rolled tobacco tin lids. The jingle dress originates from the Ojibway tribe, and the dance is known as a healing dance. You dance for the health and wellness of your loved ones for each day of the year. Whenever I hear about a powwow, I want to go and dance. In the summer, there is a powwow trail, and each weekend the five tribes of Treaty 7 have a powwow. Detail on Weasel Child’s jingle dress. I like to incorporate beaded jewellery, and I’m a big fan of cardigans with a tank top underneath, dark jeans and boots. I like the classier chic and the everyday sorts of looks. I like Chinook Mall. I shop at Forever21, Dynamite, American Eagle and Bootlegger. One of my favourite stores is Lush. I love their organic facial masks and bath bombs. What is a recent favourite find? I found a really nice scarf in a Berlin store. It’s a plain black infinity scarf, and the tag says Berlin, which I only found later. It’s a nice souvenir. When you are not acting as ambassador for Calgary Stampede and working toward your degree in mass communications, how do you relax? I am a big fan of reading, so I always like to have a book with me. You’ve had the chance to travel with your current role. Any other places that you’d like to visit? I’d like to go to Gathering of Nations in April. It’s the world’s largest powwow, and it’s held in Albuquerque, N.M.
That’s a tough one. In five years, I will have graduated from university. I would like to be a journalist and work for a news network or write about current events or work in public relations. I’ve always admired the [Aboriginal Peoples Television Network] as they report on regular and First Nations news. This story was part of Avenue’s free weekly Style Newsletter. Sign up now and get home decor and fashion information and advice in your inbox every Wednesday.